Boaters have long considered Good Luck Point one of the most significant landmarks on the New Jersey shoreline due to its location at the mouth of the Toms River. An important bird migration and wintering spot along the Atlantic Flyway, Good Luck Point has been a TPL project site since 1999, when TPL purchased 365 acres from a private development company. In 2003, TPL purchased 211 additional acres from AT&T for addition to the Edwin B. Forsythe National Wildlife Refuge. 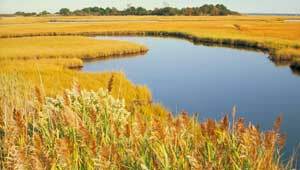 These projects, along with a 126-acre Ocean County acquisition in 2000, comprise more than 900 acres of contiguous protected land, including woodland with hiking trails, tidal marsh habitat, and scenic views across the Barnegat Bay, all in one of the fastest growing parts of the state.